On Wednesday, April 18th, Israelfest 2018 will be held at Mizner Park Amphitheater from 6-9pm. Presented by the Jewish Federation of South Palm Beach County, this event will celebrate the 70th Anniversary of the State of Israel on Israel’s Independence Day which commemorates the signing of the Israeli Declaration of Independence in 1948. Thousands of residents from the diverse local Jewish community will come together in solidarity at Mizner Park Amphitheater in observance of this momentous day in Israeli history, along with thousands of other celebrations taking place around the world. Doors to Israelfest 2018 will open at 6 pm, with the event offering an array of Israel-themed children’s activities & a fair to showcase the various local Jewish resources that are availabe. Kosher foods and beverages will also be available for purchase, including chicken, falafel, hamburgers, hotdogs, ice-cream, and more. The onstage program will begin at 7:15 pm, with a Yom HaZikaron (Israel Memorial Day) ceremony, followed by the Yom HaAtzmaut (Independence Day) festivities beginning at sundown. The celebration will also include a live concert by The Shuk, an eclectic international band that performs world and Jewish roots music, with a unique ethnic, traditional, and progressive fusion sound. This commemorative event will also feature greetings from the Consul General of Israel to Florida and Puerto Rico, Lior Haiat, along with other community leaders showing their support for Israel. 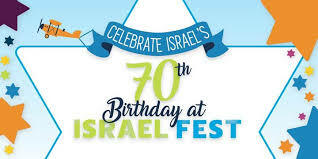 Israelfest will be held under the large amphitheater tent and will take place rain or shine. There will be complimentary self-parking and pre-set seating available, however both will be limited. It is highly recommended that attendees plan to arrive early and also bring blankets to set up on amphitheater lawn. If you have any questions or would like additional information about Israelfest 2018, please contact erinm@bocafed.org or call (561) 852-3160. Don't miss the opportunity to be part of this incredible experience of fun, music, food, and love as the community joins together to celebrate the State of Israel's independence! We look forward to seeing you there!